Can you live in this moment? Give it a try! Core scripture: “If I say, ‘I will forget my complaint, I will put off my sad face, and be of good cheer,’” (Job 9:27). Message: I was anxious to try Seesaw. It was on my list of to do’s near the beginning of the year, and I just had not gotten around to giving it a shot. The iPad app allows students to share their work with their friends—not to mention their parents—all while enjoying the opportunity to praise one another’s work with likes and positive comments. Sounds cool, right? I mean, the kids love social media. What could go wrong with that? Enter one mischievous 7th grade boy. The kids had downloaded and logged into the app. Most were doing exactly as I instructed: posting their short stories to Seesaw. I had my computer screen mirrored to the projector to show all their stories popping up, and that was when I noticed it. His playful giggle gave him away. Right there on my screen was a stick figure drawing. The character was saying, “Hi!” All it took was one kid! I rolled my eyes and moved on. Note to self … Be sure to explain to the next class that this is not condoned. Enter about five or six other stinker 7th grade boys. (Oh dear.) Let’s try this again. The kids logged in. I instructed them NOT to post any goofy stick figures, and let things happen. You can guess the results. You see, when a teenager hears one thing, they defiantly try the opposite just to see your reaction. It is ingrained in their DNA. This class took the stick figure to the next level. Even a few memes were popping up to share now. Note to self … Do not even MENTION what not to do for my next group. Enter the most immature—and when I say immature, I mean that in the nicest way! —group of 7th grade boys. (Why does it always have to be boys? Why can’t it be a girl? Just for once to mix things up?) I think the word had spread in passing period. Dude, we get to post whatever we want to Seesaw! I braced myself for the worst. Oh yeah, the worst definitely happened. I don’t think a short story even posted until a plethora of memes, stick figures, and goofy scribbled comments flooded my inbox like machine gun fire. Time to wave the white flag of surrender. But wait … What is this? A stick figure drawing from a girl??? Yes! Variety! We’ll call her Suzie. A cute little stick figure girl with a scrawled message of “Suzie is beautiful” on the bottom. Part of me wanted to shout, but do you know what won me over? The ability to laugh at the humor before me. The creativity! Oh, the splendor of making learning fun! I just chuckled. My palm hit my head as I tried to stifle a giggle. Truth be told, sometimes you just have to laugh when a new idea blows up in your face. “Lovely!” I exclaimed in a quasi-sarcastic yet affectionate tone. The kids roared with laughter. I just had to laugh with them. With this Seesaw blunder—shall we call it SeesawGate? –I had provided an awesome conversation at the dinner table. For both my students and me! Oh yeah, I could have scolded the kids in anger. I could have raised my voice and shamed them. But what I realized was the effect of laughing with my students provided so much more joy to everyone involved. Especially the teachers I talked to later. I read this article about smiling. 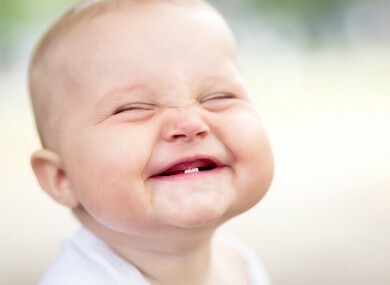 The average kid smiles about 400 times per day. The average adult? A mere 20. Ouch. What do you think God thinks about that? He gives me enough things to smile at; you would think I would take advantage of it more! My Dad loves quoting Psalm 118:24: “This is the day that the Lord has made; let us rejoice and be glad in it.” If you try hard enough, you can even find joy during those moments of frustration. So, what do I say? I say rejoice! Find a way to laugh at your troubles. A colleague of mine did that last week when she shared one of those moments via a cute snapshot of a kid who asked to do work in her Cougar Time at the end of the day. The picture was priceless. Two boys were laughing, getting no work done whatsoever. Her emoji smiley face showed that she took the same approach as me. Sometimes you just have to laugh. What did I learn from this whole ordeal? I learned that sometimes I take the world too serious in my adult eyes. Sometimes I just need to laugh at the immaturity of 7th grade boys—and one girl! Find ways to smile this week. If the class clown cracks a joke, guess what … you can chuckle! My students actually appreciated my lighthearted approach to SeesawGate. Had I cracked the whip, I am pretty sure rebellion would have ensued. The aftermath was peaceful. Kids finally did it right. They began sharing their short stories. Positive comments were popping up everywhere. Parents began to log in to see their kids’ work. And some bold students began sharing other projects that they were proud of. Lots of smiles. But do you know who was smiling the most? Our Lord was smiling down from above. Challenge: Let’s make this a fun one. I need a laugh or two this week. Share a story about a time when you just had to laugh at something a student did or said. Reply below with your best eye-roll moment. Who knows? It might just bring a smile to the face of someone who needs it. Not sure about you, but I need some this week! Article: Here is the link to the article I mentioned above. Wonderful food for thought as we slug our way to the end of 1st quarter. Prayer: Lord, allow me to find the joy in life when frustrations arise. Let me always rejoice in You! Amen. It’s about that tricky balance of often being sorrowful in this “vale of tears” that life often is, and yet always rejoicing. In the context of that verse in Job, he didn’t forget his complaint of unjust suffering, and he didn’t put his “happy face” on. Thankfully, God didn’t say “live in the [admittedly miserable] moment” but was very patient and kind with him, eventually giving him a response and alleviating his suffering. After all, as Jesus puts it, “blessed [happy] are those who mourn [the sad], for they will be comforted”.